We were sad to hear of the recent death of our colleague and friend Professor Martin Wolfe. Martin was an integral part of the team at ORC for over 25 years where he pioneered the development and organic systems through scientific research as well as practical example of farming at Wakelyns Agroforestry that he established and ran in partnership with late wife, Ann and their family. Professor of Plant Pathology Martin worked for 28 years at the Plant Breeding Institute (PBI) in Cambridge, followed by nine years in Switzerland and since 1998 and ‘retirement’ worked for the ORC and latterly Coventry University. 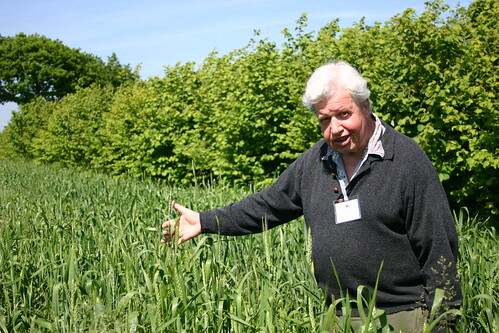 Since 1997 he, his late wife Ann, and his family have been partners in and run Wakelyns Agroforestry, a highly innovative, integrated (organic) agroforestry farm in Suffolk, east of England. Martin had a B.Sc. (Hons Agric. Bot.) University of Reading, 1960 and a Ph.D. University of Cambridge, 1963 and a life dedicated to the pursuit of knowledge. It was a career of research in and into agricultural systems. Martin was a pioneer in working in multi-disciplinary context and an agro-ecological framework, with first-hand experience of both crop and livestock research as well as farm management and the environment. This came together, and can be seen in his legacy, in his passion for an equitable and sustainable food system and on the ground at Wakelyns. Martin’s great passion was diversification of food and farming systems. From his early work at PBI through to the research he undertook right up to his death, being carried out both on Wakelyns and with the numerous research projects he engaged with, Martin championed population breeding and composite cross populations. This has its roots in landraces and he is clearly the ‘father’ of the 1st population to be marketed in the EU under the recent marketing experiment – fittingly named the ORC Wakelyns Population. Thanks to Martin’s outstanding capabilities in inspiring students and collaborators to think independently and out of the box, the population and cross breeding work has by now also created a scientifically and practically rooted 'Composite Cross Community' throughout Europe dedicated to agroecology based on diversity at all levels from the microorganisms up to humans and landscapes. Döring, Thomas F.; Howlett, S. A.; Winkler, Louisa and Wolfe, Martin (Eds.) (2013) International Symposium on Evolutionary Breeding in Cereals. The Organic Research Centre, Hamstead Marshall, UK, pp. 1-22. Döring, T F; Baddeley, J. A.; Brown, R; Collins, R; Crowley, O; Cuttle, S P; Howlett, S A; Jones, H E; McCalman, H; Measures, M; Pearce, B D; Pearce, H; Roderick, S; Stobart, R; Storkey, J; Tilston, E; Topp, K; Watson, C A; Winkler, L and Wolfe, M S (2013) LK09106/HGCA3447: Using legume-based mixtures to enhance the nitrogen use efficiency and economic viability of cropping systems. HGCA. Baddeley, J. A.; Döring, Thomas F.; Hatch, David; Marshall, Athole; Pearce, Bruce; Roderick, S; Stobart, Ron; Storkey, Jonathan; Watson, C.A. and Wolfe, Martin (2010) Using legume-based mixtures to enhance the nitrogen use efficiency and economic viability of cropping systems. In: Crighton, K and Audsley, R. (Eds.) Proceedings of the SAC/SEPA Conference, pp. 178-182. Altieri, M.A., C.I. Nicholls and M.S. Wolfe (1996) Biodiversity: a central concept in organic agriculture: Restraining pests and diseases. In: Fundamentals of Organic Agriculture. T.V. Ostergard, Editor. IFOAM. Copenhagen, Denmark. Day, P R & Wolfe, M S (1987) The genetic basis of epidemics. In: Populations of Plant Pathogens: their Dynamics and Genetics, eds. M S Wolfe & C E Caten. Oxford: Blackwells Scientific Publications, 3-6. Finckh, M. R. and Wolfe, M. S. (1997) The use of biodiversity to restrict plant diseases and consequences for farmers and society, in Ecology in Agriculture (ed. L.E. Jackson), pp199-233. Finckh, M.R. and Wolfe, M.S. (2006) Diversification strategies. In: The Epidemiology of Plant Diseases (ed. Cooke, B.M., Jones, D.G., Kaye B. ), Springer, Berlin. Finckh, M. R., Gacek, E. S., Goyeau, H., Lannou, C., Merz, U., Mundt, C. C., Munk, L., Nadziak, J., Newton, A. C., de Vallavieille-Pope, C. and Wolfe, M. S. (2000) Cereal variety and species mixtures in practice, with emphasis on disease resistance. Agronomie 20, 813-837. Fuller, R.J., Norton, L.R., Feber, R.E., Johnson, P.J., Chamberlain, D.E., Joys, A.C., Mathews, F., Stuart, R.C., Townsend, M.C., Manley, W.J., Wolfe, M.S., Macdonald, D.W. & Firbank, L.G. 2005. Benefits of organic farming to biodiversity vary among taxa. Biology Letters Online doi:10.1098/rsbl.2005,0357. Østergård, H., Finckh, M. R., Fontaine, L., Goldringer, I., Hoad, S. P., Kristensen, K., Lammerts van Bueren, E., Mascher, F., Munk, L. and Wolfe, M. S. (2009). Time for a shift in crop production: embracing complexity through diversity at all levels. Journal of the Science of Food and Agriculture, 89: 1439-1445. Phillips, S. L. and Wolfe, M. S. (2005) Evolutionary plant breeding for low input systems. .Journal of Agricultural Science, 143, 245-254. Wolfe, M. S. (1985) The current status and prospects of multiline cultivars and variety mixtures for disease resistance, Annual Review of Plant Pathology, 23, 251 273. Wolfe, M. S. (1987) The use of variety mixtures to control diseases and stabilise yield. In: Breeding Strategies For Resistance To The Rusts Of Wheat. CIMMYT, Mexico DF. Pp. 91-99. Wolfe, M. S. (2000) Crop strength through diversity Nature 406, 681-682. Wolfe, M. S. and McDermott, J. M. (1994) Population genetics of plant pathogen interactions: The example of the Erysiphe graminis Hordeum vulgare pathosystem, Annual Review of Plant Pathology, 32, 89 113.